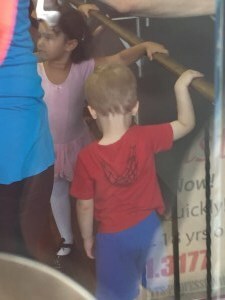 Today I brought T to his first dance class. As a dancer, this was a day I was waiting for, for a very long time. It was also my son's first class experience without one of his parents with him. As a family, we are lucky enough that I work days and my husband works part time nights and weekends, so T is able to stay home and not attend day care. His one other class experience was swim class over the summer, but his dad was in the class with him. This time he was on his own. As a dancer mom, I had mixed emotions. I couldn't wait for his first class, but I was unsure of how he would react. He had watched me teach class numerous times, but now he was the student and mom was going to off with the other moms in the waiting room. 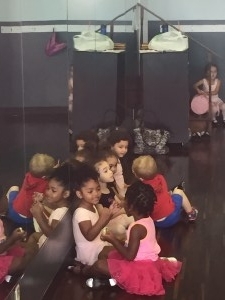 At first he was excited to have space to run around in the dance room, but when class started he wasn't so sure. I stayed in the room at first to see if he'd warm up, but I soon realized he would not be participating if I was there. I took my first opportunity when he was detached from me, to make my getaway. Conveniently, the dance school has cameras so you can watch your child from the waiting room. I watched as T stood by the door waiting for my return. He was intent on the class however. Soon he edged his way closer to the action. Eventually he stood with the group. By the time it was time to tap at the bar he was ready. Admittedly, he wasn't the best at following directions and was generally facing the opposite way at the bar, but he was participating!! I couldn't be prouder!! This is especially noteworthy as he is also the youngest kid in the class and the only boy. The class ranges from 2.5-5 and he just turned 2.5 a few weeks ago. All in all i think it was a success. He already attempted to kiss one of the girls and came out of the class saying "T shuffle." What was helpful is that his teacher is one of my closest friends so he didn't feel like everyone was a stranger. I can't wait until next Saturday to see how he progresses! !